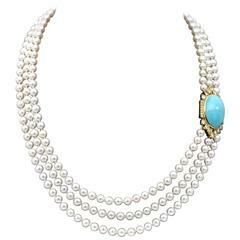 Long necklace made with turquoise, garnet, pearl, and rock crystal from Goossens Paris. Clover flower is 1”x1”. 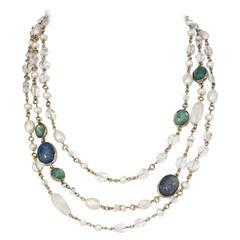 Goossens Paris triple row necklace with clear rock crystal, hand tinted rock crystals in shades of blue, and pearls. 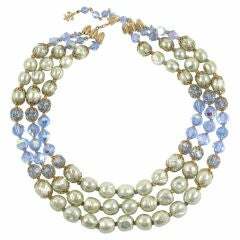 Three strand graduated necklace of faux baroque pearls and pale blue cut crystal beads. 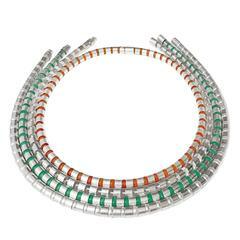 Shortest strand is 16" to 18 1/2" in length.